Learning to write with a quill pen at Historic Deerfield. Paul Shoul photo. As I turn onto Old Main Street in Deerfield, Massachusetts, the mile-long strip of road on which Historic Deerfield Museum is located, it feels as if I’ve stepped back in time. Centuries-old restored houses share yards with private family homes, the architecture so traditionally beautiful that it would be hard to tell the difference, save for the minivans in some of the driveways. It is as if the place has been in a bubble for hundreds of years, waiting patiently to be rediscovered and explored. And in a way, this is not far from the truth. Historic Deerfield is a museum consisting of 11 historic house museums, and the Flynt Center of Early New England Life, where visitors can get a firsthand look at what life was like in early America by viewing the clothing and textiles, the tools, the furniture, and, of course, the buildings. The land which is now Deerfield has actually been inhabited for centuries, appreciated by the Pocumtuck tribe for the same fertile soil that attracted European settlers in the late 17th century. The Europeans expelled the Pocumtucks, and conflict ensued. The value of the land for farming, the unfair way in which it was claimed, and its location on the northern frontier of the expanding colonial empire, all made for a dangerous life for the early settlers of Deerfield. Eventually, the frontier moved north, and Deerfield became just another colonial village. In 1936, Mr. and Mrs. Henry Flynt enrolled their son at Deerfield Academy, a prestigious prep school located in the center of Deerfield. The Flynts quickly bonded with the academy’s headmaster, Frank Boyden, over a shared passion for restoration and antiques. Impressed by the age and preservation of Deerfield’s houses, the Flynts began purchasing and restoring them. As the Flynts began their endeavor, the town’s residents joined in, contributing items found in the basements, attics, and sheds of their homes. Historic Deerfield was officially incorporated in 1952, to continue the work done by the Flynts. Today it consists of 11 houses spanning the 18th and 19th centuries, and the Flynt Center, home to those of the 25,000 antique objects which do not fit or would be out of context in the houses. My experience at Historic Deerfield begins at the Hall Tavern, an authentic 18-th century tavern which houses the Visitor’s Center. The tavern has an authentic feel to it, it is dimly lit, musty, scattered with actual barroom games of the time, and the original bar still stands in a corner, the whole scene stirring up images of early New Englanders arguing politics over pitchers of ale. 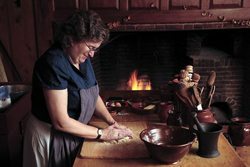 In the kitchen, utensils and ingredients used in colonial New England cooking lie about as if it were still in use, and in fact it is, as visitors can sign up for classes in which museum guides teach open hearth cooking, the method used by the earliest Deerfield residents. It’s a family outing extraordinaire, especially on a crisp fall day. Photos by Paul Shoul. The next stop is the Stebbins House, home to one of the wealthier Deerfield families. The house is incredibly well decorated for its day, with a spiral staircase, built from a design by architect Asher Benjamin, a piano, family portraits by the artist Erastus Salisbury-Field (painted in exchange for room and board), crown moldings, and detailed wallpaper, created, I am told, by a specialist who analyzed and reproduced the colors of the original design. From the Stebbins house I’m shown to the Flynt Center, built in the late 1990s to accommodate Historic Deerfield’s growing collection of Americana of the 17th, 18th, and 19th centuries. The first floor of the Flynt Center currently houses exhibits featuring furniture and textiles of the period. Although I have no real knowledge of either subject, I am able to appreciate both thanks to detailed descriptions of the materials and techniques used to create them. 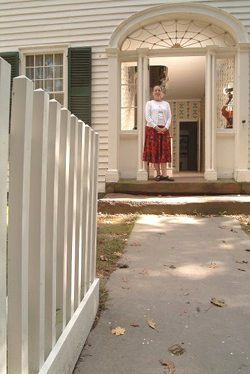 This highlights one of the great things about Historic Deerfield: there is enough detail to interest the staunchest of history buffs, but novices are also accommodated nicely. Hands on experiences like watching a baker make bread are a part of the experience at Historic Deerfield. The top floor of the Flynt Center is nothing less than the attic of all the colonial United States. Antique objects of all kinds are packed into glass display cases. Jewelry, weaponry, silverware, hardware, if it was part of life in the colonial United States, odds are you can find it at the top floor of the Flynt Center. I stop in at the museum store (try an American Heritage Chocolate Stick – a rich, spicy candy made from the same ingredients used hundreds of years ago) on my way to the Channing Blake Meadow Walk. The scenery here is incredible: without a building in sight, it is a timeless view; you can imagine the same fertile river valley exising for thousands of years, with rolling green fields stretching off to thickly forested hills in the distance. Even during my visit, on a gray, cloudy day, the mist hanging over the hills is striking. After lunch at the Deerfield Inn, I head to the Wells-Thorn House, which features rooms illustrating the changing lifestyles of Deerfield residents spanning more than a century, from 1725 to 1850. Constructed in the Georgian style, the exterior of the house is painted an extravagant light blue, a rarity for the time period. The house was originally built by a Patriot tavern owner; it would have been a popular meeting place for Deerfield’s supporters of independence during the American Revolution. Today, each room of the house is furnished to represent a different time period in early New England life, and the evolution is incredible. The first room is little more than a hearth and a few crude tools; by the last room, a hundred years later, we see elegant furniture, linens, and intricate wallpaper. As is always the case at Historic Deerfield, the guide here is incredibly knowledgeable, able to comment on even the smallest feature of any room in impressive detail. My last stop at Historic Deerfield is at the Hinsdale and Anna Williams House. Originally built in the mid-eighteenth century, the house was remodeled in 1817 into a ‘prize house,’ a showpiece for a wealthy Deerfield man to show off to his friends. The remodel was extensive, including the moving of several walls, resulting in strange part-windows and half-rooms, which give the place an air of mystery, and conjure up secret passages hiding hundred-year-old secrets. The guide here is very knowledgeable, as I’ve come to expect, and also very enthusiastic. He tells me that he likes to quiz his tour groups and joke with them in order to keep them on their toes. All in all, I was very impressed by Historic Deerfield. The quiet streets, the rolling fields and hills, and the homes preserved for hundreds of years combine to resurrect a time centuries gone. 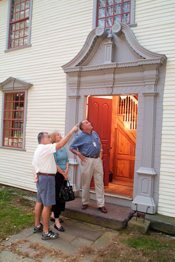 Checking out the features of an antique doorway in Historic Deerfield. The guides have a depth of knowledge so thorough it’s as if they’ve lived in the village for hundreds of years, but also the patience to deal with a novice such as myself. Whether you’re a full-fledged history buff or someone new to the subject, Historic Deerfield is a fine place to spend a quiet day in a beautiful, rural New England town. For more information visit HistoricDeerfield.org. Kevin McDowell is a graduate of the University of Massachusetts and a former intern at GoNOMAD.com. You can read more travel articles at the GoNOMAD.com Travel website, published by the same people who produced this website.